Everything looks pretty normal to me. Well that was interesting. My camera has just had a really good workout. In Auckland, it’s pretty well under-utilised when it comes to photographing bicycles. I typically have to resort to bribing the #ninjaprincess to present an image of what a #wheeledpedestrian could look like. So, it was a real thrill to be photographing bicycles that were being ridden. Being ridden slowly. Being ridden by young and old. Boys and girls. Bicycles that had mud guards and chain guards. Shopping in baskets, children in baskets. No lycra, no helmets. Just ordinary people moving ordinarily. Capturing images of #wheeledpedestrian cycling in Japan was as easy as the proverbial ‘shooting fish in a barrel’. We are told that separated cycle paths are essential to get people out riding bikes and until this infrastructure thing is sorted, a cyclised city will remain a pipe dream. Or it’s sometimes presented as a chicken versus egg conundrum. No infrastructure means no cyclists. No cyclists means no infrastructure. I am not entirely happy with this way of looking at the problem and the solutions that are proposed as a consequence of this interpretation. If it’s the absence of the separated cycle paths that stop people cycling, why do people ride bicycles in Japan? Why is Japan different? And is there anything we could learn from Japan? Let it be said that Japan is no Netherlands when it comes to catering for people on bicycles. Even though there are plenty of people on bicycles, cars still dominate. Motorists possess the typical arrogance of space. They drive too fast. Just like in any other city in the world. But for a country with such a high population density, it seemed relatively free of traffic congestion. That can probably be explained by the the fact that Japan has a phenomenal transport network. These Vine videos here, here and here, will give you an insight to what I am trying to describe. It’s all about moving people. Lots of people. Quickly, conveniently. Commuters are provided with a range of excellent transport options. And typically, the car is not the first or best choice. For many, the local train station is a short walk or bicycle ride away. Park n Ride. There are plenty of shops handy; distances that are highly achievable on a comfortable bike with capacity to carry stuff. Density done well, anyone? In Japan, people on bicycles tend to mix with pedestrians but they also ride on the roads, next to cars. Footpaths are sometimes widened to ‘accommodate’ both. This seems to work fine because of the slow speeds at which the people on bikes travel. Long haul commuters and fast moving cyclists that tend to be the norm in less developed cycling cultures, are conspicuous by their absence. The few faster ones that I saw were forced to default to that dreaded vehicular style of cycling that has limited appeal. Streets are typically narrow and speeds are typically slower. Though in some cases, it still felt too fast for me. But I watched high school students in these situations and they did not appear to be overly concerned. My favourite sight was children’s bicycles parked outside a private piano school. Mothers confident enough to let their children move about on bicycles independently? Long may it last. However, the biggest contributing factor to the existence of people on bicycles in Japan has to be the total absence of on-road parking. Cars are parked everywhere. Above ground, below ground, on every available space. But not on the road. Zero tolerance. Cars will get towed. I didn’t see that happen so it would suggest that this law is taken seriously. This absence of cars parked on the road made me realise two things – not only do cars take up so much space when they are stored on the road, they also take away something – visibility and hence, safety. So I guess if transport authorities in Japan did decide to provide specific infrastructure for cycling, the space is already there. Getting parked cars off the street; freeing up that space, has to be the biggest barrier to cyclising our cities. What I am trying to argue here is just a repetition of what I have been trying to convey throughout this blog. There is a whole swathe of the population that is currently being ignored. There is #wheeledpedestrian cycling waiting to be done right now. No special equipment or preparation needed. A young adult I spoke to in Japan said she received no special training to learn to ride a bicycle when she was at school. We aren’t quite there yet, but please, let’s not overcomplicate it. Normal is good. Let’s redefine cycling. Broaden its appeal. Treat it like a transport tool, not a sports tool. Our cities don’t need more cyclists, they need more people doing short utility trips on bikes. Make it look more appealing to a wider audience. Let’s call that ‘promotion’. 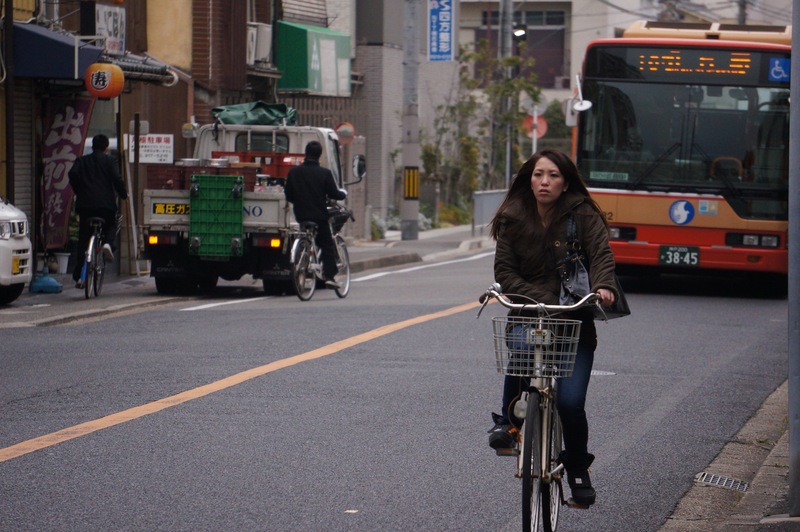 Even without specific cycling infrastructure, people in Japan ride bikes. And being that I am into redefining, can we also broaden the definition of separated cycle paths? I think turning residential roads from ‘rat runs’ into a slow speed zones, for residents and bicycles only, would fulfill the role of separation. This needs to be given priority. That’s an inclusive goal; in that it would benefit all residents, and especially children. Instead, our streets are a place to be feared, it would seem. Watching or hearing cars zoom up and down your street has to be a compelling reason why people choose to drive rather than ride. “It just doesn’t feel safe”. Let’s call that ‘policy’. You can see my photos of cycling in Japan here. I am a cyclist and an all-round nice guy. I want to be able to ride to my job in the city safely but they won’t build any separated cycle paths. Cycling is great. Everyone should be doing it. What do we have to do to get some quality cycle paths around here? I sympathise with your situation. It may be reassuring to know that you are not the only one struggling with this issue. This plays out in almost every city in the World. If we look closely at those cities that have high rates of cycling, we can see that not only do they have separated cycle paths, they have managed to create an overall transport environment that prioritises moving of people ahead of the moving of cars. This environment makes the city a more pleasant and easier place to move around for all its residents. In this kind of environment, the car is a guest and invited in under very strict conditions and requirements. This could not be any more different to how other cities treat cars. Cycling is given priority because it is proven to be such an efficient and sustainable form of transport. And most importantly, it has the ‘buy in’ of the general population. Cycling flourishes in cities which have a strong social contract like this. But we have to remember that this is very forward thinking and did not come about by accident. Politicians rarely act unilaterally. They need to know that their actions will be supported by the voting public. The catalyst for this new transport environment came about as a result of some serious campaigning. You may have heard about the Dutch ‘Stop the Child Murder’ campaign. What distinguishes that campaign from what we see in non-cycling friendly cities is that that campaign had the backing of a large and broad representation of the population. It obviously also helped that there was already a lot of utility cycling taking place in The Netherlands. Creating space on the street is a piece in the puzzle of ‘how’ to get people on bikes. But it doesn’t tell the ‘why’. Campaigning solely for separated cycle paths fails to tell a compelling, convincing or inclusive story. Clearly, the city in which you live, does not have a similar broad based support for cycling. In fact I suggest that rather than just being ambivalent, there is a downright animosity towards cycling in your city. That’s what this research seems to confirm. Motorists just don’t ‘get’ cyclists. And while this scenario prevails, while there is so little support for cycling or cyclists, it’s unlikely that any significant number of separated cycle paths will be built. You may also find that if they do get built, they will be under-utilised and be at risk to #bikelash. Having the moral entitlement to be on the road with motorists isn’t worth much at this point. Sure, there is room for an emotional argument, but it needs to presented carefully, appropriately. Well designed separated cycle paths may encourage people to ride bikes, but what strategies are being employed to get those desired cycle paths built? I fear that making requests solely for separated bike lanes at this particular stage of the evolution, may be a strategy of limited value. If the public hate cycling, then that needs to be addressed. Specific strategies need to be employed for this purpose. An image of cycling needs to be presented that is broad, relevant and inclusive. You need to be very clear about the image of cycling you want to present. Not for cyclists like you and I. We know the distinction. But for the 99%. The non-cycling public. Mostly, they are only exposed to sports and recreational cycling with high doses of hi-viz, lycra and helmets. An alternative needs to be provided. Differentiate recreational and sports cycling from the #wheeledpedestrian variety – slow, easy, comfortable, utility, urban, short distance – and keep repeating this with images and words, ad nauseum. It is this type that will have the widest appeal and outreach. It will take more than well designed separated cycle paths to encourage people to ride bicycles. Slower car speeds would improve real and perceived safety for everyone too. I also recommend that you campaign under a banner of safe streets for everyone. Once again, bringing it back to an issue of inclusivity. You need to avoid being seen by the public as a special interest group. That outlier label is going to be a difficult one to kick. You don’t want to make it any easier for those motorists to hate on you. It is not only motorists either. It always pains me when I see pedestrian advocates firing barbs at cyclists who ride on the footpath but somehow manage to sidestep the reality of the caroverkill situation and how it has arisen. Mikael at copenhagenize regularly tells us how to build the cycling infrastructure but I am not sure if he has told us yet about how to build the political will. Or maybe he has, but we have just failed to hear to him. It’s not an anti-motorist stance, but it is the car that is hogging all the space in our cities. It is the promotion of the car as the singular transport solution that is the cause of all the mayhem and destruction. Of course, it will not make you very popular to challenge the status-quo, but there are precedents. Are you aware of #VisionZero and similar campaigns? And there is no need to take it personally. Decades of policy settings have set up driving to succeed. Motorists are simply responding to behaviour cues. Try taking cigarettes off an addicted smoker. Try taking a car space away from a retailer’s front door. Same issue really. At the moment, campaigning resembles a one sided monologue between cyclists and politicians with the politicians simply covering their ears with their hands. presenting cycling as an effective transport solution; as an option that is safe, easy and convenient. You’ll recognise it when you see it.